©AecRegent: This National 2 was used by the Plymouth Health Authority, but I could not find out its actual use. An interesting addition. 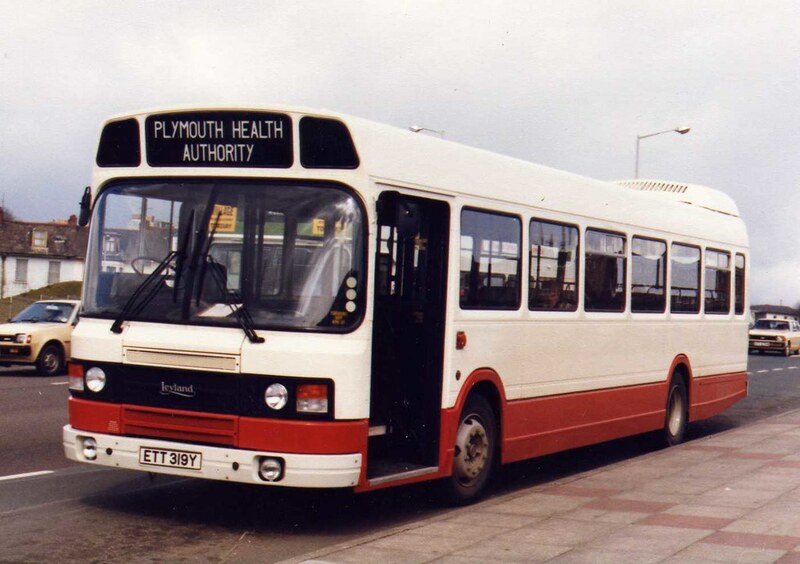 I have been meaning to show this great shot of Plymouth Health Authority's Leyland National ETT319Y since I came across it. I have spent a fair bit of time trying to upload my recent photos taken last weekend, just down the road from where this photo was taken. It was often to be found parked up here on Western Approach where it was used on a shuttle service to Moorhaven Hospital near Ivybridge. This was the second Leyland National used on this service although I cant for the life of mew remember the registration of the previous one. It was replaced by a fairly plain white Mercedes Bread minibus in 1988 I believe. The bus then went to Nottingham City Transport. 12:29 Don't forget we also have a Facebook page with info & photos of First buses in Devon & Cornwall. Become a fan. 12:14 Serious congestion in the Drakes Circus area means all buses approaching the City from Exeter Street are diverting across the Viaduct. Passengers waiting in Mayflower Street or Western Approach can catch any bus to Royal Parade to catch up with their own service. When I first joined what was Western National back in 1990 the Moorhaven Run was one of our services, Service 188 If I remember correctly operated with a Mercedes 608 which was the minibus of the time. The first one operated I think at 05:30 ish commencing at Western Approach around the city, Bus Station, North Hill, Alexandra Rd, Lipson, Embankment Rd, Plymouth Rd, Ridgeway, A38, Lee Mill, Ivybridge via Woodland Road, Through the town as the relief road hadn't been built up to Wrangaton and into Moorhaven via Green Lane. The bus was used by staff and some patients who went there on a daily basis(Some drivers/ex will be aware of Timmy who was a regular "What's your name driver"). Used to sit up in car park for about half an hour while the staff did the shift handover.I'd assume the health authority decided to contract this rather than keep their own vehicle. Was quite a nice run as it got you out of the city for a while, with time for a coffee and a read at the other end.